The Courageous Leader presents a much-needed reminder for leaders everywhere: it takes courage. Courage is not just about heroic acts in grandiose situations—it's about everyday, solid-as-a-rock support and leadership that motivates, inspires, and delivers. It's about taking a risk on a great idea, and it's about seeing opportunities in the day-to-day. Courageous leaders aren't necessarily the bold "Navy SEALS" of the workplace; they're the everyday people who lead steadily through rough waters. They don't seek out discomfort, but accept it as part of the process when it occurs, and still deliver exceptional results. This book shows you how to tap into your courage reserves and build your steel. Real stories of everyday leaders show you how it's done, and provide a new lens for seeing real strength in adversity—and practicing it yourself. Tough situations do arise, but great leaders show courage every day. Keeping your strength in reserve for the big problems leaves you operating at less-than-full capacity the rest of the time—and your people deserve better. This book shows you how to exercise courage every day in small situations to build the unshakeable foundation of a great leader. The more you exercise courage, the stronger it gets; this book shows you how to use it every day to more effectively navigate small challenges—when the big problems arise, you'll face them with The Courageous Leader. 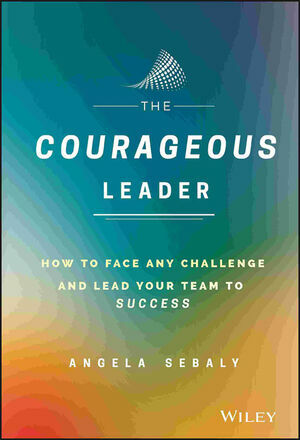 ANGELA SEBALY is cofounder and CEO of Personify Leadership. She has more than twenty years' experience in leadership development working with thousands of leaders around the world, assessing their unique talents and guiding them to the next level of performance. A natural leader, entrepreneur, sought-after coach, and trainer, she has held senior roles with leading organizations in the telecommunications, construction, hospitality, and oil and gas industries. Your Vote Counts, and You Get to Vote for You!